To compensate for the lack of a 3.5mm headphone port on the new iPhone 7 and iPhone 7 Plus, Apple yesterday introduced the "AirPods." The wireless headphones give users 5 hours of music playback, and come in a carrying case that doubles as a battery pack, holding an extra 24 hours of charge in a small, 2-inch tall frame. Following the keynote presentation yesterday, Apple let a few members of the press test out its new pieces of hardware, including the iPhone 7, Apple Watch Series 2, and the AirPods. Although the noisy showroom made it tough for many journalists to judge the headphones' sound quality -- which Apple says is "rich, high quality AAC audio" -- many left impressed with the new technology, and curious to see how they'd perform on a day-to-day basis. TechCrunch noted the subtle advantages of AirPods and their existence in the Apple ecosystem, mainly the seamless way that the headphones pause music automatically whenever users take them out of their ears, and resume the same track when returned. The site was less sure of the design of the AirPods, particularly whether or not the small headphones would stay in place during jogs or other strenuous workouts, although the "long tail" of the AirPods "actually goes a ways toward helping them fit better in the ear." It’s an interesting aesthetic choice, one that bucks the recent trend of fully wireless Bluetooth headphones, which are largely circular. 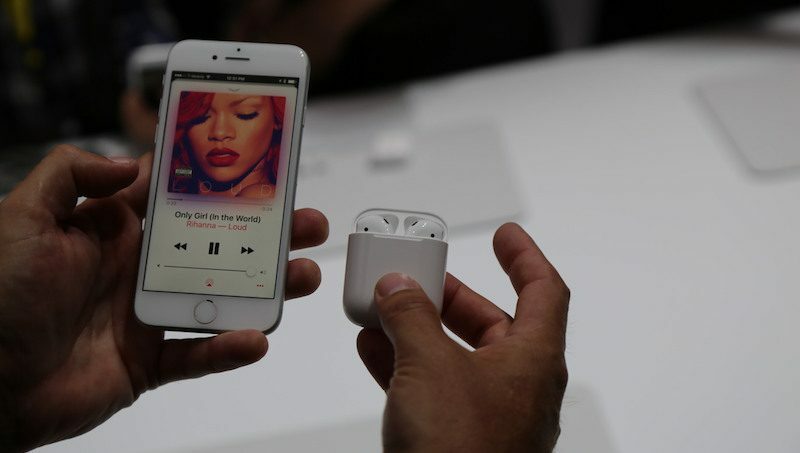 These maintain the EarPods’ long tail, which actually goes a ways toward helping them fit better in the ear. As a counter-argument to everyone's concerns over whether the AirPods can become dislodged while moving, USA Today digital editor Natalie DiBlasio posted a short video on Twitter to test out the AirPods' resistance to jumping and shaking around. Only 9 seconds long, DiBlasio's test is still interesting as proof that the AirPods appear lodged well enough in her ears as to resist her movement test, although a long run with more sweat and motion could prove a more daunting task for Apple's wireless headphones. CNET's editors gave some of the more positive impressions of the AirPods, calling the new headphones "game-changers," with the caveat of the device living up to Apple's promised potential of high quality music and a consistent connection. There still remains worry over how different sized ears will work with the AirPods, which could cause unfortunately negative experiences for some users. Wired left impressed with what the AirPods could do for the wireless headphone market, particularly in the hassle-free set-up process, but was noticeably more hopeful for "something that looks and sounds better" than the AirPods to come down the line in the future. For what Apple's made now, the site still noted that the AirPods were "much lighter" than other Bluetooth headphones, and they "nestled comfortably" in the ear. I hope that AirPods don’t scare everyone else off from trying to make Bluetooth headphones. I don’t think they will, because they don’t sound good enough. And these aren’t the ones that will ship in the box with your iPhone 7; you get the standard EarPods when you buy an iPhone, which connect over Lightning now. (There’s also an adapter.) But hopefully Apple has set the bar for how easy it should be to connect Bluetooth headphones, and how responsive they should be. If someone can copy that, and make something that looks and sounds better, we might not miss the headphone jack at all. These appear to be the same shape as the current earbuds. Why is this such a big question when we have a nearly identical product in our hands today? 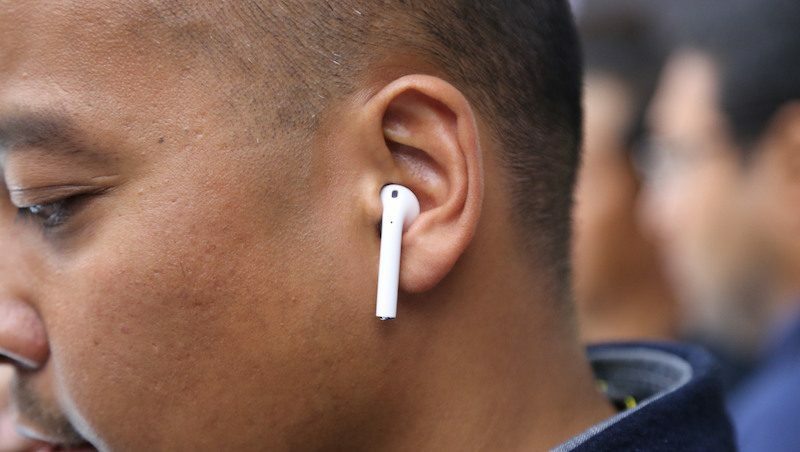 CNET ('http://www.cnet.com/products/apple-airpods/preview/')'s editors gave some of the more positive impressions of the AirPods, calling the new headphones "game-changers," with the caveat of the device living up to Apple's promised potential of high quality music and a consistent connection. "Game changer" isn't the first phrase that comes to my mind when thinking about these new things, especially considering the cost and a single available color. Wireless, regardless of which technology, isn't new and isn't a game changer anymore. CNN says, "If they...[live up to marketing hype that essentially describes them behaving very similar to other high end bluetooth headphones].. they will be games changers." What game are they changing? Has gamechanger jumped the shark? The original iPhone was a gamechanger. New wireless headphones? C'mon. Those wireless airpods should of came with the iPhone instead of people buying them separate.Not Cool Apple!!!!!! "Now, that plastic has been a deal-breaker for me for years—I hate how normal EarPods feel in my ears. They don’t seem like they’re going to stay put, and they simply fall out if I move my head too much. Even if they do stay in, after about a half hour, my ears just start to ache, although I don’t experience the same pain when using earbuds with silicone or foam tips. Since the AirPods look so similar, I expected them to feel the same too—and I’m surprised and happy to report that I was dead wrong." "Not only did I dance, I headbanged. I shook my head side to side, I tossed my hair, I jogged in place, and I looked silly doing all of it. The AirPods stayed put, and they stayed loud." More vertical marketing by Apple - you'll need to purchase Apple curated headbands to wear to be sure those AirPods to fall out while you're on the move AND, the best part, they're being curated to match your Apple Series 2 watchbands - don't be caught dead without them. I know that the original EarPods were actually the most conformable on-ear almost in-ear buds I've ever personally used. Much better than the told ones and they've never fallen out on me. Everyone's ears are different though. I assume that if you hate the EarPods, you'll hate these too. Still, despite my reservations about price, I am really tempted by these.